Join us. Together we will build the law firm of the future. Dentons Business Services EMEA (DBSE), a center of excellence, provides business services to our offices across Europe and the Middle East, covering a wide portfolio of diversified and high value-added roles in finance, marketing and business development, IT, risk management, HR and many other areas. Located in an attractive office space in the center of Warsaw, we currently count around 200 employees. 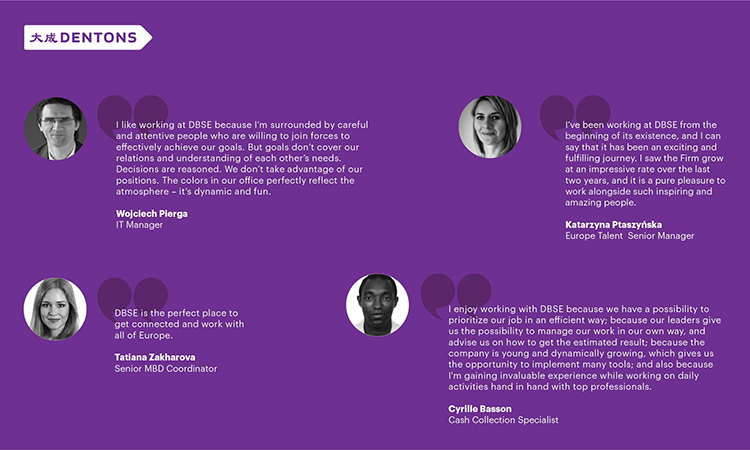 Their backgrounds, experiences and interests are as diverse as their roles in DBSE. Which forms a team of great professionals continuously working with other Dentons’ teams all over Europe and Middle East. Every idea and opinion is welcomed, as we believe that together, we shape the way, not only within the Dentons network but also in the communities around us. … we want to hear from you!